Yes, the only positive element of the week (knitting-wise, anyway) – I finished the front of St. Enda. As I was working along on my little nupps, I thought, “Gee, these aren’t as hard as I remembered.” After four rows I realized there was a good reason for this. I was making 5 stitch nupps instead of 7 stitch nupps. Since it was only four rows, I laboriously tinked back. I was ready to start again, when I realized, to my great horror, that about halfway down there were a couple of nupps where I had not picked up all 7 stitches and there was one lone little stitch poking its head out! How in the world had I not noticed this before? Now, the directions tell you this can happen and that you can just go back later and tie them in. But I have this great aversion to having extra yarn ends to weave in, in addition to having a somewhat obsessive personality. And since I was still so early in the shawl, I decided to frog. 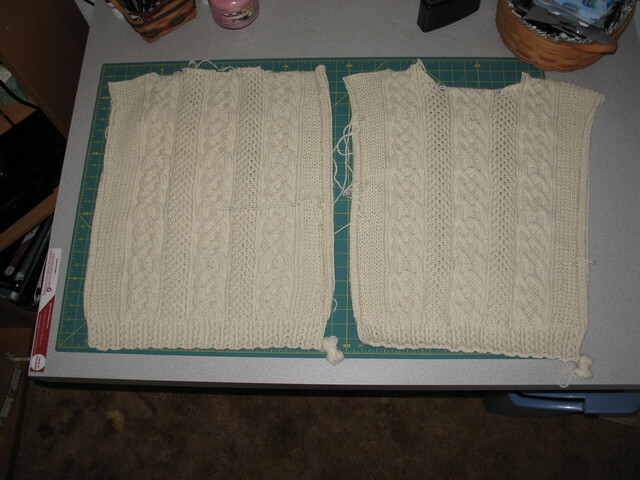 So I took it off the needles, frogged back to one row before the errors (at least they were on the same row!) and tinked from there. I have discovered the way to prevent this in the future is (drum roll, please), to actually PAY ATTENTION to my knitting. Novel concept, huh? It is a relatively easy task to check each nupp on the return knit row. You can obviously see if any stitches have failed to catch on the previous purl row and correct them immediately, without frogging, ripping, tinking or anything resembling such. And I found two on the very first row. Made a believer out of me. Anyway, I was so upset that I decided to cast on for another scarf. I know, I have the attention span of a fruit fly. However, after three tries, I was not pleased with any of the patterns. This is the latest attempt – what do you think? I think it is too open – not enough “fabric”. Meanwhile, Izzy, back in England, was blissfully unconcerned with all of this, because she found someone to hold hands with while she sleeps. St. Edna looks beautiful. You had a very successful week of knitting even if it did end with a bummer. Yes, I think the scarf looks too open, but my personal preference is for a more substantial fabric. So, consider the source. There’s no denying it is very pretty. 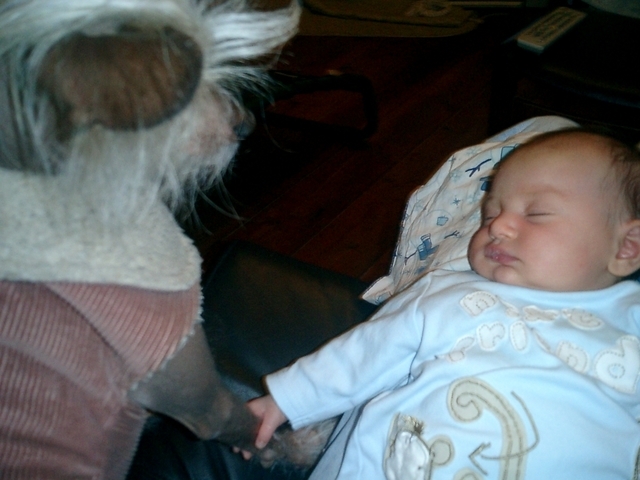 Now, about that adorable picture of Izzy and the dog. That is a dog? Right? I’ve been straining my eyes to try and see what the dog is wearing. It looks like a terry bib over some undog like garment. Please enlighten. I think your scarf looks perfect!!! Beautiful! I’ve had a negative knitting week myself…I’ve frogged the same stupid sock about 10 times now trying to find a pattern that suits the yarn…sheesh! Sorry about your fractious nupps but I would have frogged/tinked too…there are just some things I can’t live with! 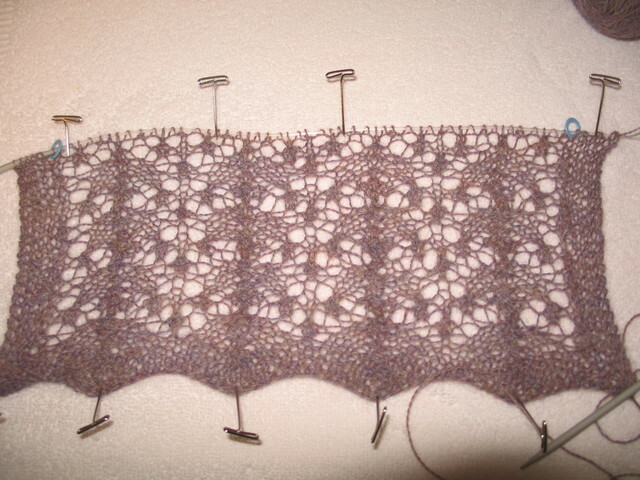 When I knit Madli’s shawl, I counted obsessively just to avoid having to tink! I feel your pain, D.
Well, Dorothy…it looks like a pretty good outcome after all! I am just amazed at your ability with lace… and ability to have such a cute little granddaughter!